Simplified Chinese characters (简化字; jiǎnhuàzì) are standardized Chinese characters prescribed in the Table of General Standard Chinese Characters for use in mainland China. Along with traditional Chinese characters, they are one of the two standard character sets of the contemporary Chinese written language. The government of the People's Republic of China in mainland China has promoted them for use in printing since the 1950s and 1960s to encourage literacy. They are officially used in the People's Republic of China and Singapore. Traditional Chinese characters are currently used in Hong Kong, Macau, and the Republic of China (Taiwan). While traditional characters can still be read and understood by many mainland Chinese and the Chinese community in Malaysia and Singapore, these groups generally retain their use of simplified characters. Overseas Chinese communities generally tend to use traditional characters. Simplified Chinese characters may be referred to by their official name above or colloquially (简体字; jiǎntǐzì). The latter refers to simplifications of character "structure" or "body", character forms that have existed for thousands of years alongside regular, more complicated forms. On the other hand, the official name refers to the modern systematically simplified character set, which (as stated by then-Chairman Mao Zedong in 1952) includes not only structural simplification but also substantial reduction in the total number of standardized Chinese characters. Simplified character forms were created by reducing the number of strokes and simplifying the forms of a sizable proportion of Chinese characters. Some simplifications were based on popular cursive forms embodying graphic or phonetic simplifications of the traditional forms. Some characters were simplified by applying regular rules, for example, by replacing all occurrences of a certain component with a simplified version of the component. Variant characters with the same pronunciation and identical meaning were reduced to a single standardized character, usually the simplest amongst all variants in form. Finally, many characters were left untouched by simplification, and are thus identical between the traditional and simplified Chinese orthographies. Some simplified characters are very dissimilar to and unpredictably different from traditional characters, especially in those where a component is replaced by a simple symbol. This has led some opponents of simplification to complain that the 'overall process' of character simplification is arbitrary. Proponents counter that the system of simplification is straightforward and internally consistent. Proponents have also emphasized a some particular simplified characters as innovative and useful improvements, although many of these have existed for centuries as longstanding and widespread variants. A second round of simplifications was promulgated in 1977, but was later retracted in 1986 for a variety of reasons, largely due to the confusion caused and the unpopularity of the second round simplifications. However, the Chinese government never officially dropped its goal of further simplification in the future. In August 2009, the PRC began collecting public comments for a modified list of simplified characters. The new Table of General Standard Chinese Characters consisting of 8,105 (simplified and unchanged) characters was officially implemented for use by the State Council of the People's Republic of China on June 5, 2013. Although most of the simplified Chinese characters in use today are the result of the works moderated by the government of the People's Republic of China (PRC) in the 1950s and 60s, character simplification predates the PRC's formation in 1949. Cursive written text almost always includes character simplification. Simplified forms used in print are attested as early as the Qin dynasty (221–206 BC). The first batch of Simplified Characters introduced in 1935 consisted of 324 characters. One of the earliest proponents of character simplification was Lufei Kui, who proposed in 1909 that simplified characters should be used in education. In the years following the May Fourth Movement in 1919, many anti-imperialist Chinese intellectuals sought ways to modernise China. Traditional culture and values such as Confucianism were challenged. Soon, people in the Movement started to cite the traditional Chinese writing system as an obstacle in modernising China and therefore proposed that a reform be initiated. It was suggested that the Chinese writing system should be either simplified or completely abolished. Lu Xun, a renowned Chinese author in the 20th century, stated that, "If Chinese characters are not destroyed, then China will die" (汉字不灭，中国必亡). Recent commentators have claimed that Chinese characters were blamed for the economic problems in China during that time. In the 1930s and 1940s, discussions on character simplification took place within the Kuomintang government, and a large number of Chinese intellectuals and writers maintained that character simplification would help boost literacy in China. In 1935, 324 simplified characters collected by Qian Xuantong were officially introduced as the table of first batch of simplified characters, but they were suspended in 1936. The PRC issued its first round of official character simplifications in two documents, the first in 1956 and the second in 1964. Within the PRC, further character simplification became associated with the leftists of the Cultural Revolution, culminating with the second-round simplified characters, which were promulgated in 1977. In part due to the shock and unease felt in the wake of the Cultural Revolution and Mao's death, the second-round of simplifications was poorly received. In 1986 the authorities retracted the second round completely. Later in the same year, the authorities promulgated a final list of simplifications, which is identical to the 1964 list except for six changes (including the restoration of three characters that had been simplified in the First Round: 叠, 覆, 像; note that the form 疊 is used instead of 叠 in regions using Traditional Chinese). There had been simplification initiatives aimed at eradicating characters entirely and establishing the Hanyu Pinyin romanization as the official written system of the PRC, but the reform never gained quite as much popularity as the leftists had hoped. After the retraction of the second round of simplification, the PRC stated that it wished to keep Chinese orthography stable. Years later in 2009, the Chinese government released a major revision list which included 8,300 characters. No new simplifications were introduced. However, six characters previously listed as "traditional" characters that have been simplified, as well as 51 other "variant" characters, were restored to the standard list. In addition, orthographies (e.g., stroke shape) for 44 characters were proposed to be modified slightly to fit traditional calligraphic rules. Also, the practice of unrestricted simplification of rare and archaic characters by analogy using simplified radicals or components is now discouraged. A State Language Commission official cited "oversimplification" as the reason for restoring some characters. The language authority declared an open comment period until August 31, 2009 for feedback from the public. The proposed orthographic changes to 44 characters were not implemented due to overwhelmingly negative public opinion. The officially promulgated version of the List of Commonly Used Standardized Characters, announced in 2013, contained 45 newly recognized standard characters that were previously considered variant forms, as well as official approval of 226 characters that had been simplified by analogy and had seen wide use but were not explicitly given in previous lists or documents. Singapore underwent three successive rounds of character simplification, eventually arriving at the same set of simplified characters as Mainland China. The first round, consisting of 498 Simplified characters from 502 Traditional characters, was promulgated by the Ministry of Education in 1969. The second round, consisting of 2287 Simplified characters, was promulgated in 1974. The second set contained 49 differences from the Mainland China system; those were removed in the final round in 1976. In 1993, Singapore adopted the six revisions made by Mainland China in 1986. However, unlike in mainland China where personal names may only be registered using simplified characters, parents have the option of registering their children's names in traditional characters in Singapore. Malaysia promulgated a set of simplified characters in 1981, which were also completely identical to the simplified characters used in Mainland China. Chinese-language schools use these. Traditional characters are still often seen in decorative contexts such as shop signs and calligraphy in both countries. A small group called Dou Zi Sei (T:導字社; S:导字社)/Dou Zi Wui (T:導字會; S:导字会) attempted to introduce a special version of simplified characters using romanizations in the 1930s. Today, however, the traditional characters remain dominant in Hong Kong. After World War II, Japan also simplified a number of Chinese characters (kanji) used in the Japanese language. The new forms are called shinjitai. Compared to Chinese, the Japanese reform was more limited, simplifying only a few hundred characters, most of which were already in use in cursive script. Further, the list of simplifications was exhaustive, unlike Chinese simplification – thus analogous simplifications of not explicitly simplified characters (extended shinjitai) are not approved, and instead standard practice is to use the traditional forms. The number of characters in circulation was also reduced, and formal lists of characters to be learned during each grade of school were established. The overall effect was to standardize teaching and the use of Kanji in modern literature and media. Chart 1 lists all 350 characters that are used by themselves, and can never serve as 'simplified character components'. Chart 2 lists 132 characters that are used by themselves as well as utilized as simplified character components to further derive other simplified characters. Chart 2 also lists 14 'components' or 'radicals' that cannot be used by themselves, but can be generalized for derivation of more complex characters. Chart 3 lists 1,753 characters which are simplified based on the same simplification principles used for character components and radicals in Chart 2. This list is non-exhaustive, so if a character is not already found in Chart 1, 2 or 3, but can be simplified in accordance with Chart 2, the character should be simplified. Series One Organization List of Variant Characters accounts for some of the orthography difference between Mainland China on the one hand, and Hong Kong and Taiwan on the other. These are not simplifications of character structures, but rather reduction in number of total standard characters. For each set of variant characters that share the identical pronunciation and meaning, one character (usually the simplest in form) is elevated to the standard character set, and the rest are obsoleted. After rounds of revisions, by 1993, some 1,027 variant characters have been declared obsolete by this list. Amongst the chosen variants, those that appear in the "Complete List of Simplified Characters" are also simplified in character structure accordingly. New standardized character forms originated from the "List of character forms of General Used Chinese characters for Publishing" containing 6,196 characters, published in 1965. The new forms tend to adopt vulgar variant forms for most of its characters. The List of Commonly Used Characters in Modern Chinese list, published in 1988, contains 7,000 commonly used characters, and replaces the 1965 list. Since the new forms take vulgar variants, many characters now appear slightly simpler compared to old forms, and as such are often mistaken as structurally simplified characters. All characters simplified this way are enumerated in Chart 1 and Chart 2 in the Complete List of Simplified Characters. Characters in both charts are structurally simplified based on similar set of principles. They are separated into two charts to clearly mark those in Chart 2 as 'usable as simplified character components', based on which Chart 3 is derived. 穀 → 谷; 醜 → 丑; 蘋 → 苹; 鬆 → 松; 隻 → 只; 乾、幹 → 干; 髮 → 发; etc. 書 → 书; 長 → 长; 當 → 当; 韋 → 韦; 樂 → 乐; 車 → 车; 興 → 兴; 發 → 发; 東 → 东; 專 → 专; 過 → 过; 報 → 报; 爾 → 尔; 盡 → 尽; 學 → 学; etc. 對 → 对; 觀 → 观; 歡 → 欢; 難 → 难; 鳳 → 凤; 風 → 风; 這 → 这; 劉 → 刘; etc. 廠 → 厂; 廣 → 广; 誇 → 夸; 習 → 习; 寧 → 宁; 滅 → 灭; 親 → 亲; 業 → 业; 鄉 → 乡; 餘 → 余; 氣 → 气; etc. 婦 → 妇; 麗 → 丽; 歸 → 归; 顯 → 显; 務 → 务; etc. 飛 → 飞; 龜→ 龟; 齒 → 齿; 奪 → 夺; 門 → 门; 見 → 见; etc. 鄰 → 邻; 斃 → 毙; 蠟 → 蜡; 鍾/鐘→ 钟; 艦 → 舰; etc. 華 → 华; 憲 → 宪; 歷、曆 → 历; 賓 → 宾; etc. 護 → 护; 驚 → 惊; 藝 → 艺; 響 → 响; etc. 麼 → 么; 開 → 开; 裡 → 里; 餘 → 余; 關 → 関 → 关; etc. 廣 → 广; 個 → 个; 親 → 亲; 產 → 产; 類 → 类; 廠 → 厂; 鄉 → 乡; etc. 塵 → 尘; 膚 → 肤; 從 → 从; 眾 → 众; 雲 → 云; 網 → 网; 與 → 与; 無 → 无; 電 → 电; etc. 體 → 体; 國 → 国; 憑 → 凭; 陽 → 阳; 陰 → 阴; etc. 餘 → 余; 後 → 后; 裏, 裡 → 里; etc. 義 → 义(乂); 發 → 发(友); 龍 → 龙(尤); 無 → 无(天); 頭 → 头(大); 萬 → 万(方); etc. The "Complete List of Simplified Characters" employs character components, not the traditional definition of radicals. A component refers to any conceivable part of a character, regardless of its position within the character, or its relative size compared to other components in the same character. For instance, in the character 摆, not only is 扌 (a traditional radical) considered a component, but so is 罢. Each of the 132 simplified characters in Chart 2, when used as a component in compound characters, systematically simplify compound characters in exactly the same way the Chart 2 character itself was simplified. For instance, 單 is simplified in Chart 2 to 单. Based on the same principle, these derivations can be made: 彈 → 弹; 嬋 → 婵; 囅 → 冁; etc. The 14 simplified components in Chart 2 are never used alone as individual characters. They only serve as components. Example of derived simplification based on the component 𦥯, simplified to 龸, include: 學 → 学; 覺 → 觉; 黌 → 黉; etc. Chart 1 collects 352 simplified characters that generally cannot be used as components. Even in rare cases where a Chart 1 character is found as a component in a compound character, the compound character cannot be simplified in the same way. For instance, 習 is simplified in Chart 1 to 习, but 褶 cannot be simplified to 「衤习」. A character that is already explicitly listed as simplified character in the "Complete List of Simplified Characters" cannot be alternatively simplified based on derivation. For instance, 戰 and 誇 are simplified in Chart 1 to 战 and 夸 respectively, thus they cannot be simplified alternatively by derivation via 单 and 讠 in Chart 2 to 「𢧐」 and 「讠夸」. 過 is simplified in Chart 2 to 过, thus it cannot be alternatively derived via 呙 in Chart 2 as 「𬨨」. 𦥯 → 龸, thus 學 → 学; 覺 → 觉; 黌 → 黉; etc. 單 → 单, thus 彈 → 弹; 嬋 → 婵; 囅 → 冁; etc. 頁 → 页, thus 顏 → 颜; 頷 → 颔; 順 → 顺; 額 → 额; etc. 專 → 专, thus 傳 → 传; 轉 → 转; 磚 → 砖; etc. 食 → 饣, thus 飯 → 饭; 飽 → 饱; 飼 → 饲; 餃 → 饺; etc. 言 → 讠, thus 話 → 话; 語 → 语; 誰 → 谁; etc. 姪 → 侄; 蹤 → 踪; 恆 → 恒; 佇 → 伫; 虖、嘑、謼 → 呼; 夠 → 够 etc. 異 → 异; 淚 → 泪; 災、烖、菑 → 灾; etc. 傑 → 杰; 貓 → 猫; 豬 → 猪; 獃、騃 → 呆; etc. 裏 → 裡 → 里; 歎 → 嘆 → 叹; 唘、啓 → 啟 → 启; 鬦、鬪、鬭 → 鬥 → 斗; 厤、暦 → 曆 → 历; 歴 → 歷 → 历; etc. In some instance, the chosen variant is actually more complex than eliminated ones. This is often taken up by opponents of simplification who are not aware of the dual goals of simplification (i.e. in structure of characters as well as in total number of characters) to decry that simplification does not always simplify characters. An example is the character 搾 which is eliminated in favor of the variant form 榨. Note that the "hand" radical 扌, with three strokes, on the left of the eliminated 搾 is now "seen" as more complex, appearing as the "tree" radical 木, with four strokes, in the chosen variant 榨. 粵 → 粤; 奧 → 奥; etc. 溫 → 温; 媼 → 媪; etc. 虛 → 虚; 噓 → 嘘; etc. 靜 → 静; 睜 → 睁; etc. 換 → 换; 煥 → 焕; etc. 園 → 园; 遠 → 远; etc. It is a common misconception that the simplification process is arbitrary and not based on consistent rules. These allegations are often made when people 'discover' their own 'principles of simplification' from anecdotal evidence. Note, however, that simplification by derivation must follow the rules mentioned earlier. An often cited example of the apparent irregularity of simplification involves characters that appear to share the simple symbol 又 used in many simplified characters in Chart 1. Often it is intuited that 又 is a 'character component', after observing 漢 → 汉, 難 → 难, 癱 → 瘫, etc. A student of simplification may infer that the same simplification mechanism also works for 嘆 → 叹 and 灘 → 滩. When observing that 歎 → 叹, 歡 → 欢, 勸 → 劝, 灌 (not simplified) and 罐 (not simplified), one may come to the conclusion that the process of simplification is irregular. However, in the Complete List of Simplified Characters, 漢 → 汉 appears in Chart 1. 難 → 难 is listed in Chart 2. And 癱 → 瘫 is a derived character found in the non-exhaustive list in Chart 3. Therefore, 难 is defined as a 'simplified character component' according to the standard, while 又 is not. Based on 难, 癱 is simplified to 瘫, and 灘 to 滩. In the "Series One Organization List of Variant Characters", the variant character 歎 is replaced by 嘆. The character 嘆 is simplified in Chart 1 to 叹. Therefore, 歎 → 叹. Both 歡 → 欢 and 勸 → 劝 appear in Chart 1. Thus they are not defined as derived characters. There are no characters or components found in Chart 2 usable for derivation of 灌 and 罐. Further investigation reveals that these two characters do not appear in Chart 1 nor in "Series One Organization List of Variant Characters". Thus they are not defined as simplified characters; they remain unchanged from traditional forms in the "List of Commonly Used Characters in Modern Chinese". Not all new character forms result in simpler characters (i.e. fewer strokes). For instance, the old form 強, with 11 strokes, now appears as 强, with 12 strokes, in the new form. However, technically, these new character forms do not constitute simplified characters. Strangely, some characters with the water radical with three dots 氵 in the traditional form were simplified into the ice radical with two dots 冫 in the simplified form. Some examples are 決 → 决, 況 → 况, and 湊 → 凑. The slogan 战无不胜的毛泽东思想万岁! (Zhàn wúbù shèng de Máo Zédōng sīxiǎng wànsuì! ; Long live the invincible Mao Zedong Thought!) on Xinhua Gate in Beijing. The People's Republic of China, Singapore and Malaysia generally use simplified characters. They appear very sparingly in printed text produced in Hong Kong, Macau, Taiwan, and overseas Chinese communities, although they are becoming more prevalent as China opens to the world. Conversely, the mainland is seeing an increase in the use of traditional forms, where they are often used on signs, and in logos, blogs, dictionaries, and scholarly works. 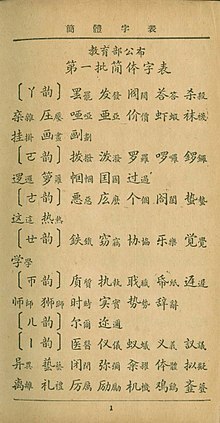 The Law of the People's Republic of China on the National Common Language and Characters implies simplified Chinese as the standard script, with Traditional Chinese being used for purposes such as ceremonies, cultural purposes (e.g. calligraphy), decoration, publications and books on ancient literature and poetry, and research purposes. Traditional Chinese remains ubiquitous on buildings predating the promotion of simplified characters, such as former government buildings, religious buildings, educational institutions, and historical monuments. Traditional Chinese is also often used for commercial purposes, such as shopfront displays and advertisements. As part of the one country, two systems model, the PRC has not attempted to force Hong Kong or Macau into using simplified characters. The PRC tends to print material intended for people in Hong Kong, Macau and Taiwan, and overseas Chinese in Traditional characters. For example, it prints versions of the People's Daily in Traditional characters and both the People's Daily and Xinhua websites have versions in Traditional characters using Big5 encoding. Mainland companies selling products in Hong Kong, Macau and Taiwan use Traditional characters on their displays and packaging to communicate with consumers (the reverse is true as well). Dictionaries published in mainland China generally show both simplified and their Traditional counterparts. In digital media, many cultural phenomena imported from Hong Kong and Taiwan into mainland China, such as music videos, karaoke videos, subtitled movies, and subtitled dramas, use Traditional Chinese characters. Textbooks, official statements, newspapers, including the PRC-funded media, show no signs of moving to simplified Chinese characters. However, some students may opt to use the simplified form when taking notes or doing test papers to write faster. It is common for Hong Kong people to learn traditional Chinese characters in school, and some simplified Chinese in passing (either through reading mainland-published books or other media). For use on computers, however, people tend to type Chinese characters using a traditional character set such as Big5. In Hong Kong, as well as elsewhere, it is common for people who use both sets to do so because it is much easier to convert from the traditional character set to the simplified character set because of the usage of the aforementioned methods 8 and 9 of simplification[clarification needed]. Simplified Chinese characters are not officially used in governmental and civil publications in Taiwan. However, it is legal to import simplified character publications and distribute them. Certain simplified characters that have long existed in informal writing for centuries also have popular usage, while those characters simplified originally by the Taiwanese government are much less common in daily appearance. In all areas, most handwritten text will include informal simplifications (alternative script) which are not the same as the simplifications officially promulgated by the PRC and are often instead influenced by the shinjitai used in Japan. The informal simplification of the first character of "Taiwan" from 臺 to 台 rivals its orthodox form in commonality, even in print and in answers to school exams. In Singapore, where Chinese is one of the official languages, simplified characters are the official standard and used in all official publications as well as the government-controlled press. While simplified characters are taught exclusively in schools and are used in all official publications, the government does not officially discourage the use of traditional characters and still allow parents to choose whether to have their child's Chinese name registered in simplified or traditional characters. In Malaysia, Chinese is not an official language, but over 90% of ethnic-Chinese students are educated in Chinese schools, which have taught simplified characters since 1981. However, traditional characters are widely used by older generations and are widespread on signboards, etc. Most of Malaysia's Chinese newspapers compromise by retaining traditional characters in article headlines but using simplified characters for content. As there is no restriction of the use of traditional characters in the mass media, television programmes, books, magazines and music CD's that have been imported from Hong Kong or Taiwan are widely available, and these almost always use traditional characters. Most karaoke discs, being imported from Hong Kong or Taiwan, have song lyrics in traditional characters as well. Many shop signs continue to be written in traditional characters. Menus in hawker centres and coffee shops are also commonly seen in traditional characters. In general, schools in Mainland China, Malaysia and Singapore use simplified characters exclusively, while schools in Hong Kong, Macau, and Taiwan use traditional characters exclusively. Today, simplified Chinese characters predominate among college and university programs teaching Chinese as a foreign language outside of China, such as those in the United States. In December 2004, Ministry of education authorities rejected a proposal from a Beijing CPPCC political conference member that called for elementary schools to teach traditional Chinese characters in addition to the simplified ones. The conference member pointed out that most mainland Chinese, especially young people, have difficulties with traditional Chinese characters; this is especially important in dealing with non-mainland communities such as Taiwan and Hong Kong. The educational authorities did not approve the recommendation, saying that it did not fit in with the "requirements as set out by the law" and it could potentially complicate the curricula. A similar proposal was delivered to the 1st Plenary Session of the 11th Chinese People's Political Consultative Conference in March 2008. Most, if not all, Chinese language text books in Hong Kong are written in traditional characters. Before 1997, the use of simplified characters was generally discouraged by educators. After 1997, while students are still expected to be proficient and utilize traditional characters in formal settings, they may sometimes adopt a hybrid written form in informal settings to speed up writing. With the exception of open examinations, Simplified Chinese characters are considered acceptable by the Hong Kong Examinations and Assessment Authority for their speed. Chinese textbooks in Singapore and Malaysia are written exclusively in simplified characters, and only simplified characters are taught in school. Traditional characters are usually only taught to those taking up calligraphy as a co-curricular activity or Cantonese as an elective course at school. As the source of many Mandarin Chinese textbooks is mainland China, the majority of textbooks teaching Chinese are now based on simplified characters and Hanyu Pinyin – although there are textbooks originating in China which have a traditional version. For practical reasons, universities and schools prepare students who will be able to communicate with mainland China, so their obvious choice is to use simplified characters. In places where a particular set is not locally entrenched, e.g., Europe and the United States, instruction is now mostly simplified, as the economic importance of mainland China increases, and also because of the availability of textbooks printed in mainland China. Teachers of international students often recommend learning both systems. In the United Kingdom, universities mainly teach Mandarin Chinese at the undergraduate level using the simplified characters coupled with pinyin. However, they will require the students to learn or be able to recognise the traditional forms if they are studying in Taiwan or Hong Kong (such as taking Cantonese courses). In Australia and New Zealand, schools, universities and TAFEs use predominantly simplified characters. Russia and most East European nations are traditionally oriented on the education of the PRC's system for teaching Chinese, which uses simplified characters but exposes the learners to both systems. In South Korea, universities have used predominantly simplified characters since 1990s. In high school, Chinese is one of the selective subjects. By the regulation of the national curricula standards, MPS I and traditional characters had been originally used before (since the 1940s), but by the change of regulation, pinyin and simplified characters have been used to pupils who enter the school in 1996 or later. Therefore, MPS I and traditional characters disappeared after 1998 in South Korean high school Chinese curriculum. In Japan there are two types of schools. Simplified Chinese is taught instead of traditional Chinese in pro-mainland China schools. They also teach Pinyin, a romanization system for standard Chinese, while the Taiwan-oriented schools teach Zhuyin, which uses phonetic symbols. However, the Taiwan-oriented schools are starting to teach simplified Chinese and Pinyin to offer a more well-rounded education. In the Philippines, the use of simplified characters is getting more and more popular. Before the 1970s, Chinese schools in the Philippines were under the supervision of the Ministry of Education of the Republic of China. Hence, most books were using the Traditional Characters. Traditional Characters remained prevalent until the early 2000s. However, institutions like the Confucius Institute, being the cultural arm of the People's Republic of China, are strong proponents of the use of Simplified Characters. Also, many new schools are now importing their Mandarin textbooks from Singapore instead of Taiwan. Public universities such as the Linguistics and Asian Languages Department of the University of the Philippines use Simplified Characters in their teaching materials. On the other hand, private schools such as Chiang Kai Shek College and Saint Jude Catholic School remain major proponents of the usage of Traditional Characters. However, some private universities, such as the Ateneo de Manila University, now use Simplified Characters. In computer text applications, the GB encoding scheme most often renders simplified Chinese characters, while Big5 most often renders traditional characters. Although neither encoding has an explicit connection with a specific character set, the lack of a one-to-one mapping between the simplified and traditional sets established a de facto linkage. Since simplified Chinese conflated many characters into one and since the initial version of the GB encoding scheme, known as GB2312-80, contained only one code point for each character, it is impossible to use GB2312 to map to the bigger set of traditional characters. It is theoretically possible to use Big5 code to map to the smaller set of simplified character glyphs, although there is little market for such a product. Newer and alternative forms of GB have support for traditional characters. In particular, mainland authorities have now established GB 18030 as the official encoding standard for use in all mainland software publications. The encoding contains all East Asian characters included in Unicode 3.0. As such, GB 18030 encoding contains both simplified and traditional characters found in Big-5 and GB, as well as all characters found in Japanese and Korean encodings. Unicode deals with the issue of simplified and traditional characters as part of the project of Han unification by including code points for each. This was rendered necessary by the fact that the linkage between simplified characters and traditional characters is not one-to-one. While this means that a Unicode system can display both simplified and traditional characters, it also means that different localization files are needed for each type. The Chinese characters used in modern Japanese (called Kanji characters) have also undergone simplification, but generally to a lesser extent than with simplified Chinese. It is worth mentioning that Japan's writing system utilizes a reduced number of Chinese characters in daily use, resulting partly from the Japanese language reforms; thus, a number of complex characters are written phonetically. Reconciling these different character sets in Unicode became part of the controversial process of Han unification. Not surprisingly, some of the Chinese characters used in Japan are neither 'traditional' nor 'simplified'. In this case, these characters cannot be found in traditional/simplified Chinese dictionaries. The World Wide Web Consortium's Internationalization working group recommends the use of the language tag zh-Hans as a language attribute value and Content-Language value to specify web-page content in simplified Chinese characters. ^ Refer to official publications: zh:汉字简化方案, zh:简化字总表, etc. ^ 教育部就《汉字简化方案》等发布 50 周年答记者提问 Semi-centennial celebration of the publication of Chinese Character Simplification Plan and official press conference. ^ 書同文 :《漢字簡化方案》制訂始末，黄加佳，新华网. Detailed account of the Chinese simplification effort. ^ Examples of characters where a component is replaced by a simple symbol include: 对(對), 邓 (鄧), 观 (觀), 欢 (歡). ^ a b In his book, 彭小明 fails to understand that 又 is not used as a simplified component (簡化偏旁 or 简化偏方), thus deriding the 'supposedly inconsistent application' of 又 in 欢, 汉, 仅, etc. The author also misrepresents the rationale behind the simplification of 團, as well as cursive-based simplifications. See Chinese Wikipedia's discussion on simplification and explanations in original, official papers such as 简化字总表. 彭小明 (January 2008). 漢字簡化得不償失. Hong Kong: 夏菲爾國際出版公司. ISBN 9789629380687. ^ In '17个角度看到繁简体汉字 (经济观察网)' (part1 and part2), for instance, the scholar 裴钰 praises the simplified character 体 as an ingenious new invention, when in fact it has existed for hundreds of years (see 康熙字典「体」). ^ "Simplified Chinese characters". www.omniglot.com. Retrieved 2016-03-16. ^ 关于《通用规范汉字表》公开征求意见的公告 Archived 2009-08-15 at the Wayback Machine. Page about the list at the State Language Commission's website, including a link to a pdf of the list. Accessed 2009.08.18. ^ 汉字，该繁还是简？ Archived 2009-04-28 at the Wayback Machine. Syndicated from 人民日报 (People's Daily), 2009-04-09. Accessed 2009.04.10. ^ "Archived copy" 专家称恢复繁体字代价太大 新规范汉字表将公布. Xinhua News. 2009-04-09. Archived from the original on 2009-04-12. Retrieved 2009-04-10. CS1 maint: Archived copy as title (link) Syndicated from 新京报, 2009-04-09. Accessed 2009.04.10. ^ China to regulate use of simplified characters_English_Xinhua Archived 2009-08-16 at the Wayback Machine. News.xinhuanet.com (2009-08-12). Retrieved on 2013-07-21. ^ 国务院关于公布《通用规范汉字表》的通知. Government of the People's Republic of China. 2013-08-19. ^ Yen, Yuehping. (2005). Calligraphy and Power in Contemporary Chinese Society. Routledge. ISBN 0-415-31753-3. ^ 简化字的昨天、今天和明天. Archived from the original on 2011-07-14. Retrieved 2010-01-17. ^ "China to regulate use of simplified characters Archived 2009-08-16 at the Wayback Machine", China View, August 12, 2009. Accessed 2009-08-17. ^ All examples listed here are sourced from 简化字#字型結構簡化#簡化方法 where all entries are associated with proper references. ^ a b This is very similar to the 'elimination of variants of the same character' in "Series One Organization List of Variant Characters", except that these eliminations happen in Chart 1 and Chart 2 of "Complete List of Simplified Characters". Characters simplified in Chart 2 can be further used for derivation of Chart 3, but those chosen in "Series One Organization List of Variant Characters" cannot. ^ 基測作文 俗體字不扣分]，蘋果日報. Apple News. April 12, 2006. ^ Shih, Hsiu-chuan (14 December 2010). "Premier respects 'choice' on spelling". Taipei Times. Retrieved 8 January 2015. ^ Norden, Bryan W. Van (2011). Introduction to Classical Chinese Philosophy. Hackett Publishing. p. 242. ISBN 9781603846158. Most contemporary Chinese language programs at U.S. colleges and universities emphasize the simplified form. ^ 千龙网-北京-市教委驳回政协委员普及繁体字教学建议 [Beijing – City Education Committee rejects commissar of the Chinese People's Political Consultative Conference to popularize the traditional character teaching suggestion]. qianlong.com. 2004-12-08. ^ "Debate: A need to introduce traditional characters to schools?". Archived from the original on 2008-03-17. Retrieved 2008-03-15. ^ Richard Ishida (editor): Best Practice 13: Using Hans and Hant codes in Internationalization Best Practices: Specifying Language in XHTML & HTML Content – W3C Working Group Note 12 April 2007. Bergman, P. M. (1980). The basic English-Chinese, Chinese-English dictionary: using simplified characters (with an appendix containing the original complex characters) transliterated in accordance with the new, official Chinese phonetic alphabet. New York: New American Library. ISBN 0-451-09262-7. Bökset, R. (2006). Long story of short forms: the evolution of simplified Chinese characters. Stockholm East Asian monographs, No. 11. Stockholm: Dept. of Oriental Languages, Stockholm University. ISBN 91-628-6832-2. Chen, H. (1987). Simplified Chinese characters. Torrance, CA: Heian. ISBN 0-89346-293-4.